Combo Corner: Sareeni and Yuswan! That's right, from beginners to veterans, you cleaned us out! Thankfully we have more cards to spare in the office. We've already received online orders to get your cards! A harem of all-male Renegades and Meddlers puts the pressure on! Wow! It's rather shocking how well these two play with each other! They both cost 1 GP, so it's easy to get them both into the scene. To explain just how awesome this combo is, let me explain. First, you can lay down Yuswan and start paying AP to deal direct pleasure to your opponent. He recovers 1 stamina per turn, so you can get an extra shot in each turn. Then along comes Sareeni, who can recover Yuswan's stamina faster. Wait, that's not all! Sareeni is Feisty, so you'll get 1 extra AP on your next turn, since she's exhausted. Not only is she helping Yuswan recover that stamina, she's also generating the AP to keep using Yuswan's skill! You're dealing 2 pleasure per turn with this combo, but with each additional Sareeni you add to the scene, you're dealing 1 extra pleasure per turn! With three Sareenis all tending to Yuswan, you can give 4 pleasure per turn, for free! Sareeni and Yuswan can be found in Brundali Rail Heist booster packs! Additionally, Sarreni can be found twice in The Full Monte starter deck! 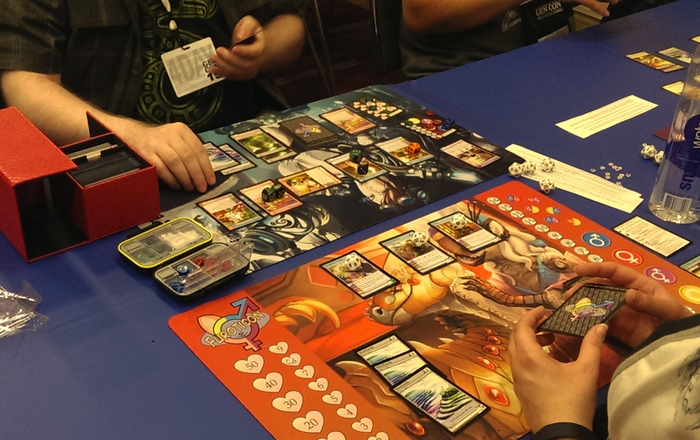 I had an absolute blast at Gen Con. 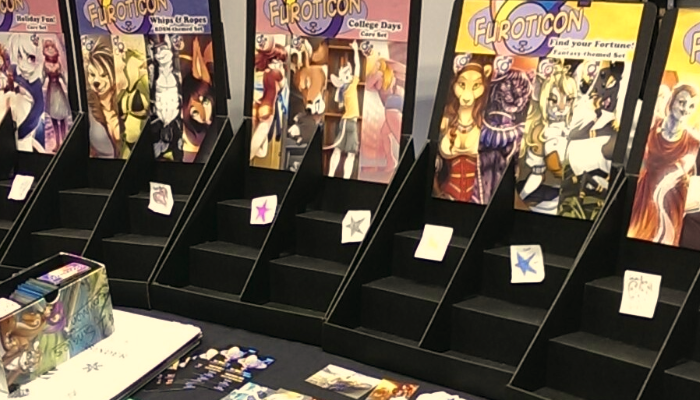 Playing Furoticon pretty much every night was among my greatest highlights of the Convention. It was great to see and hang out with everyone and I had a blast. So glad that Furoticon was there again this year. 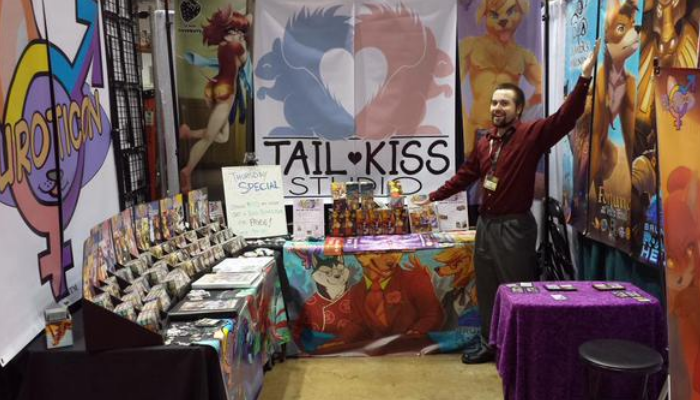 I look forward to seeing you all return for Gen Con 2016! thinking i might be blind... pulled a bunch of both from my order and never saw this combo. and i even made a Fem/OK deck. which i will now be rethinking and probably rebuilding. That is a magnificent booth you had there. I agree with gnarleynarwhal, Sareeni is just the cutest. I feel like I've said that before on a different post, but the frills and her big eyes and her curly hair are worth remarking on again. While it is great to see your business is doing well, and I understand the importance of conventions in this line of work, I would think fulfilling the orders that have already been paid for would be the priority over selling new product, especially when that order was almost $300. And yes, I tried e-mailing and got no reply. Awesome! I'm glad to see everything sold out O: I know I picked up my share on Thursday. Didn't get a good opportunity to come play though. It was cool seeing you again, Seppel!